Sara Mohr-Pietsch with Radio 3's celebration of singing together. 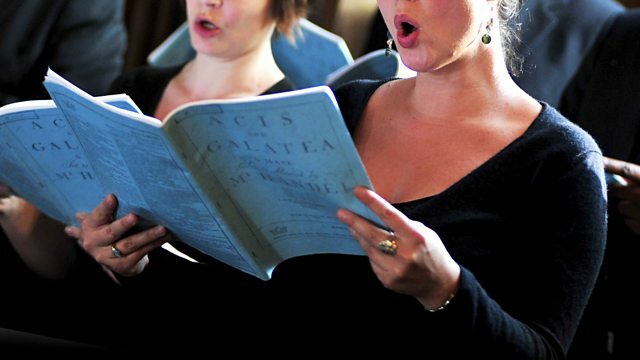 There's choral music from across the centuries, Welsh amateur choir Cor y Gors introduce themselves in "Meet My Choir" and Sara's Choral Classic is Borodin's Polovtsian Dances. SOLI DEO GLORIA : SDG-162. Music Arranger: John Rutter. Ensemble: Dunedin Consort. Conductor: Ben Parry. Ensemble: Siu Tuita Floor Show. FANSHAWE, David: Pacific Song: Chants from the Kingdom of Tonga. Singer: Sandrine Piau. Singer: Mark Padmore. Singer: Neal Davies. Ensemble: Gabrieli Consort & Players. Ensemble: Gabrieli Players. Director: Paul McCreesh. Performer: Göteborgs Symfoniska Kör. Orchestra: Gothenburg S O.. Conductor: Neeme Järvi. Choir: La Venexiana. Director: Claudio Cavina. Singer: Anna Cavaliero. Choir: The Choir Of Trinity College, Cambridge. Conductor: Stephen Layton. Choir: Cappella Mediterranea. Choir: Namur Chamber Choir. Ensemble: Clematis Ensemble. Conductor: Leonardo García Alarcón.